An undrafted free agent out of college, Biasucci beat out four other placekickers to be signed by the Colts in 1984 after Raul Allegre was injured in the opening game. While Allegre returned, Biasucci was retained for kickoffs. He was cut during the ’85 preseason and sat out the year, but came back to beat out Allegre in 1986 and was successful on 13 of 25 field goal attempts and 26 of 27 extra points. Colts went 9-6 in the strike-shortened season (three games were played with replacement players) to finish first in the AFC East and reach the postseason for the first time since moving to Indianapolis. Lost AFC Divisional playoff to Cleveland Browns (38-21). Effective in clutch situations and with a strong leg, Biasucci went on to play seven more seasons with the Colts and was a first-team All-NFL selection by The Sporting News after scoring a career-high 114 points in 1988. 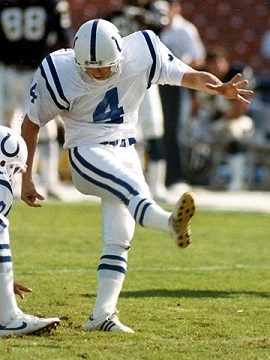 Having kicked 176 field goals and scored 783 points with the Colts, which were franchise records at the time, Biasucci signed with Pittsburgh in 1995, was released, and finished his career with the St. Louis Rams. Overall, he was successful on 185 of 262 field goal attempts (70.6 %) and added 268 PATs for a total of 823 points.